Major Dr. Pravin Prathip J is presently settled in chennai.He was born in the coastal town of tuticorin in a middle class family.He has completed his BDS from Sri Ramachandra Dental College in the year 2002.He was one of the few to get selected in the Indian Army Dental Corps. 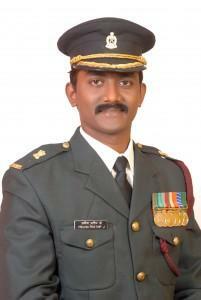 He has served the Prestigious Indian Army Dental Corps as a Short service commissioned Dental Officer. He is a practicing Dentist, Implantologist specialising in full mouth rehabilitation. He has authored a book on Dental Practice Management titled, He is a Practice Management Consultant, Sales Trainer, Business, Financial and Life coach. He is a self made businessman and a successful entrepreneur. Teaching is his passion and he travels around the world and many parts of the country to talk about Dental Business and Practice Management. He is a certified trainer by Success Resources International. He is also an Evangelist and does a lot of charitable work for many churches and NGOs. He loves young people and he has inspired many by his high power motivational speeches and leadership trainings. His goal is to help you achieve your personal and business goals faster and easier than you ever imagined. Malligai Dental Academy is located in the well popular locality of Ashoknagar 7th avenue in Chennai.It is Hardly 8 kms from chennai Airport by Road and 15 min by chennai Metro.It was established in the year 2013 for a small group of doctors who wants to learn Dental Implants from our Dear Major Pravin. Major Pravin's Goal is "Simplicity makes understanding better".All Our courses are very practical,up to date and with definite Practical training on hands on models and live Patient training. We have two state of the art hospitals attached with our academy to learn all the patient related work .Both our hospitals and academy are fully airconditioned and are all located in the groundfloor for easy access.We have totally 5 chairs in both the setup with all state of the art facility like in house OPG,LASERS,and Implant surgical motors. Our Mission is to constantly upgrade our Participant's Knowledge by providing the best and great Mentors on each speciality for their training thereby updating them with the latest developments in the field.Your success is our success. Our Value is what we believe.We beleive that Simplicity makes our Understanding of the profession better .We need to learn to grow. No learning is No growth. If we don't grow we are dying.The more we learn The more we earn. We beleive that every doctor should invest 10% of their income as minimum committment to upgrade their knowledge. "Empowering and Enriching Dentist's lives by providing great valuable continuing dental education so that they stay a step ahead in life and in business and profession of dentistry so they can flourish and thrive"